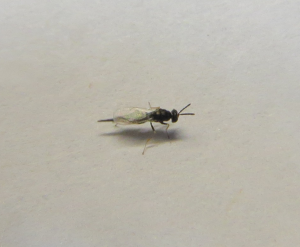 Adult T. planipennisi wasp collected as a pupa in Ozaukee County, May 2017. 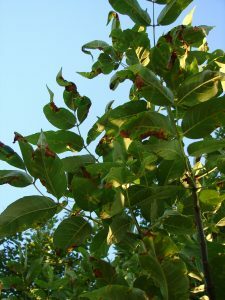 This species attacks EAB larvae beneath the bark. 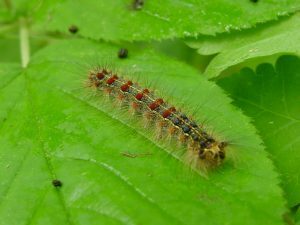 Actual size is 1/8” in length. Oak wilt fruiting body formed under the bark, shown here with the bark peeled away. The dark grey lump of stuff is the fruiting body which produces the spores. 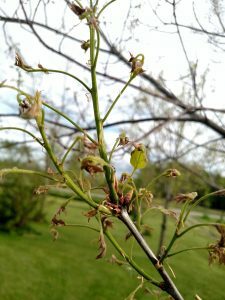 I’ve identified oak wilt in Plum Lake Township, Vilas Co, west of Sayner. 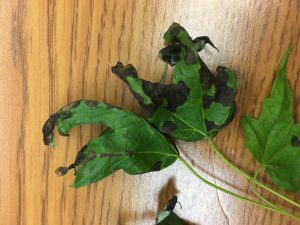 This is the first find of oak wilt in Plum Lake Township. 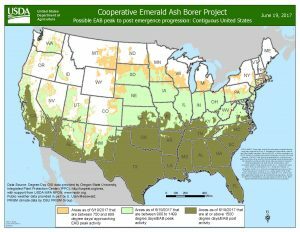 The closest known oak wilt location is 6.7 miles from this new site. The tree rapidly dropped its leaves last July, and when it didn’t leaf out this spring the homeowner called me. 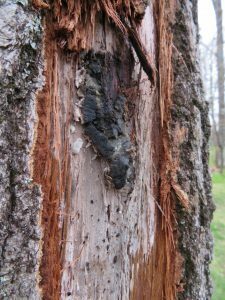 Upon examining the tree I was able to find an oak wilt pressure pad, which is the fungal spore mat that forms under the bark and causes the bark to crack, which is how beetles can get access to the spores and move them to other oaks. 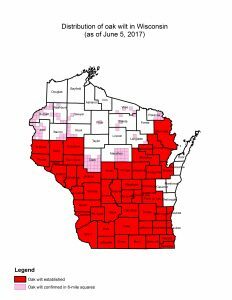 Oak wilt is found throughout the counties shown in red. 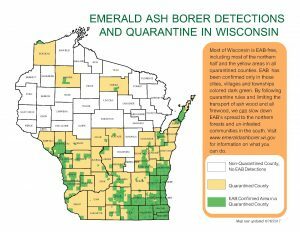 Where oak wilt is uncommon the townships where oak wilt has been identified are shaded in pink. 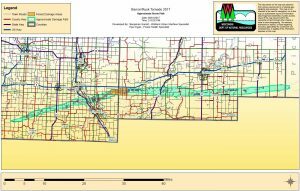 The oak wilt map has been updated. 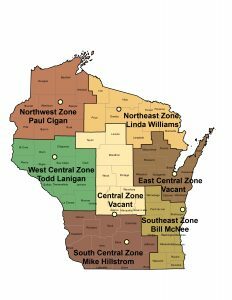 Oak wilt is not common in our northern counties so the map highlights in pink the townships where oak wilt has been identified in the northern counties. 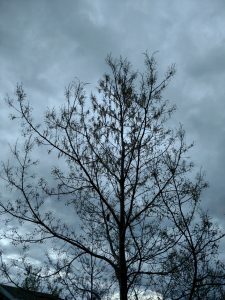 The oak wilt guidelines for timber sales were updated about a year ago and list some exceptions and modifications for situations in which it is not necessary to implement the cutting restrictions during the high risk time period of the year (April 15 – July 15 in the north). 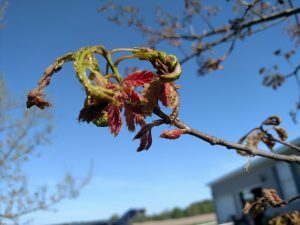 Homeowners and those not doing timber sales should try to avoid pruning, wounding, or cutting oaks during the high risk time period of April 15 – July 15 in the north. 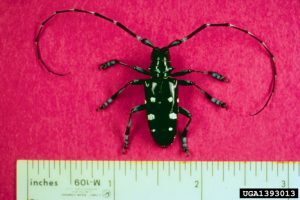 This is the time of year when the beetles that can spread the spores overland will be attracted to fresh wounds on your trees; if you prune, wound, or cut your oaks during this period the beetles can introduce oak wilt to your tree. 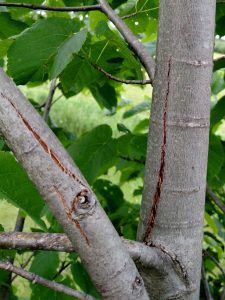 If it is necessary to prune, wound, or cut trees during that period, wound paint should be applied. 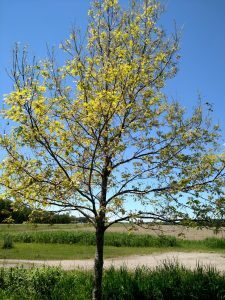 Oak wilt is always fatal to trees in the red oak group, which includes northern red oak, northern pin oak, and black oak. 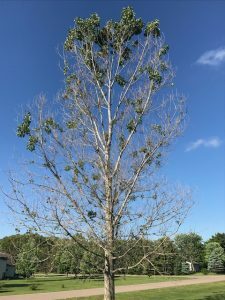 Trees that were infected with the oak wilt fungus this spring will begin rapidly dropping their leaves in July and August.